What is the official name of this feast? While it is popularly known as the Feast of Christ the King, it's technical name is the Solemnity of Christ the King. It's original Latin title was Dominus Nostri Jesu Christi Regis, which was changed by Pope Paul VI to Dominus Nostri Jesu Christi universorum Regis (Our Lord Jesus Christ King of the Universe). Solemnity is the highest rank given to a feast by the Church. What color vestments will the priest be wearing tomorrow? White or Gold as he does for all major feasts. 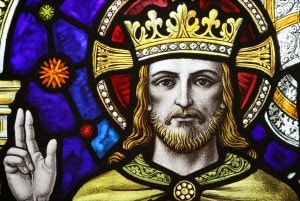 When is Christ the King celebrated? Christ the King closes the liturgical year and is always celebrated on the last Sunday of ordinary time, the last Sunday before the first Sunday of Advent. This year the feast will be celebrated this Sunday on November 20th. Is Christ the King celebrated in the forma extraordinaria, the 'traditional Latin Mass'? Yes, but on a different date. In the old pre-Vatican 2 calendar the Feast of Christ the King is celebrated on the last Sunday in October, the Sunday before All Saint's Day. This is one of those areas where we might be better off changing the old calendar to match up with the new. That, however, is well above my pay grade. Is this an ancient feast? No. In fact it only dates to the twentieth century. Pope Pius XI founded the feast with his 1925 encyclical Quas Primus. That means no complaining about the change of date after Vatican Two. Is there any Biblical evidence that Jesus is a King? I thought He was a poor, simple man. Do any other Christians celebrate this feast? Yes. Following the lead of Pius XI in honoring Christ as King with this feast are Anglicans, Lutherans, Methodists, Presbyterians, the Church of England, the United Church of Christ, and some Eastern Orthodox Churches all of whom adopted the feast after the Catholic Church. I suppose even high Church Protestants can look to Rome for guidance now and then. I'd call that ecumenism at its best. What other posts have you written on Christ the King? Quas Primus, Pope Pius XI on Christ the King (pt 2) - being the second part of the same. Homeless Jesus - being a reflection on a statue blessed by Pope Francis. The Homeless King - being the second part of the same. Our World is "Enemy-Occupied Territory. Are YOU Ready to Fight? - being a call to arms of sorts.